Motherhood Moment: Book Nook: The Five Star Man - Dating Handbook for Women Only! 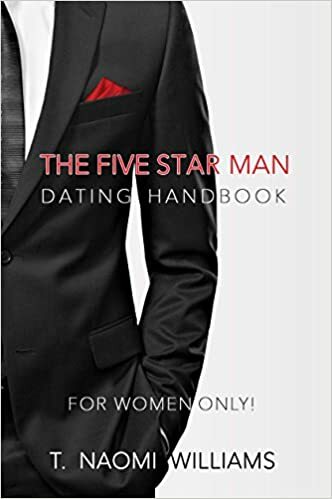 Book Nook: The Five Star Man - Dating Handbook for Women Only! Dating can be tricky. It's hard to find just the right person, and sometimes we try to make relationships work when they don't, because we want to be close to someone. Early-onset infatuation is what author and dating coach T. Naomi Williams refers to as "dating under the influence,” but she can help. I had a chance to read her debut book, The Five Star Man: Dating Handbook for Women Only! She shifts the focus - instead of looking at typical ways to catch a man, she examines the qualities and role of men in dating. Instead of basing dating decisions on attraction and desire, she encourages women to make their decisions based on self-worth and value. She provides ways to evaluate men in five key categories: financial, emotional, social, psychological, and spiritual (even for those who aren't devoutly religious, spirituality is an important consideration). I'm fortunate that I have been out of the dating pool for over fifteen years, but it was interesting to evaluate my husband by her criteria, both the man he was when we first started dating, and the man he is now. T. Naomi Williams is an author and dating coach who has counseled many women through the dating process, sharing wisdom acquired through her own dating experiences as well as from the countless stories shared by other women. Through counseling, she has come to understand the concerns that today's women have for their futures. Her increased desire to be supportive of women in the dating arena inspired her to write The Five Star Man. Williams also serves as a director for a faith-based organization in New York City. For more information, please visit www.thefivestarman.com.